The Chrysler 300c is now gaining its popularity in the limousine service industry. It provides a sophisticated and elegant appeal to the arrival of its passengers. This vehicle promotes a contemporary style which is made prevalent by its interior designs. 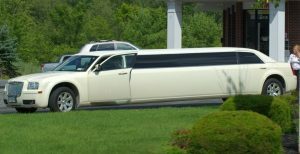 It makes a statement of elegance and style that is why so many people choose this type of limo hire. Fast Limo Hire offers the Chrysler 300C limo for hire at excellent conditions and affordable prices. It can accommodate up to 8 passengers and it provides them all with all the luxury that they desire. It is fully packed with both video and audio systems making the ride even more entertaining and enjoyable. The passengers are provided with leather seats of the vehicle to ensure comfort. The passengers are provided with privacy which is made possible by the window divider and any communication with the driver for any special or additional instructions can be done through the hands-free intercom built in its interior. Its bar is made of marble and fully packed with drinks that all the passengers can enjoy. This is considered the best contemporary and innovative Chrysler limousine hire. It offers an enjoyable ambience brought about by the responsive ceiling colour change. It is also incorporated with fibre optics and an LCD touchscreen control panel which makes it a highly innovative service. Choose a contemporary and stylish limousine service. Call Fast Limo Hire now on 020 3006 2092 and talk to our expert customer service team for more details about the Chrysler limousine hire London.